The US Army has just unveiled its first smart weapon using smart rounds in small weapons - a gun that can fire rounds that explode exactly at a pre-set distance. 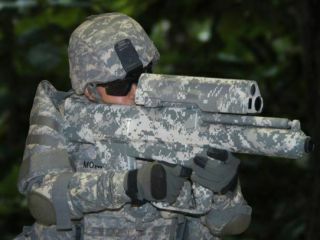 The XM-25 Counter Defilade Target Engagement System looks like a rifle but is actually a powerful grenade launcher that fires ammunition that knows when to blow up. Richard Audette, a US Army spokesperson, explains that soldiers can use the gun's laser rangefinder to find the range then choose exactly where they want the high-explosive round to detonate. "Say you've lased out to 543 meters. When you pull the trigger it arms the round and fires it 543 meters plus or minus a one-, two- or three-meter increment, then it explodes over the target." This means that soldiers can set the round to explode while passing above enemies lying in trenches or next to targets hiding around corners. The gun communicates with the 25mm explosive round via radio, and the bullet knows how it far it has travelled by counting its own revolutions as it spins through the air, using a magnetic induction, according to New Scientist. "For example," says Audette, "In Iraq we had many instances where there was a sniper firing from a rooftop where soldiers couldn't get to him with the weapons they had. So they'd call in the Air Force to drop a $20,000-50,000 (£12,500-30,000) JDAM (joint direct attack munition). Now we can take out the target for $25 (£15)." The semi-automatic XM-25 has an effective range of 750 meters and carries a magazine containing five rounds. As well as saving money, it is hoped that the new weapon will reduce civilian casualties.